The Monastery celebrates on the 5 th of July the assumption of Saint Athanasios Athonitis who built the Monastery in 963 A.D. The monks of Megistis Lavras also commemorate Virgin Mary Koukouzelissa on the 1st of October. The Monastery is located a little further north of the southeast tip of the peninsula of Athos in altitude 40m. on a rocky level. It is a 1,5-hour drive from Karies by vehicle and approximately 7 hours away for hikers, while from the coast it is a 20' distance. It is first in the hierarchy of the monasteries in Mount Athos and also the largest of all and it is linked to the principle of organized life on Athos which is the oldest example. The material resources for the building of the Monastery Lavras (=extensive monastery) in 963 A.D. were offered by the Byzantine Emperor Nikiforos Fokas. Shortly after the death of the Nikiforos Fokas, the emperor Ioannis Tsimiskis gave direct assistance for the implementation of the plan. The Monastery successively flourished and declined, experienced attacks, arson attacks and looting by pirates, robbers and the missionary criminals who returned from the Crusades. In the 11th century there were almost 700 monks in Megisti Lavra. Their number then fell dramatically and in the middle of the 17th century only five monks had remained. 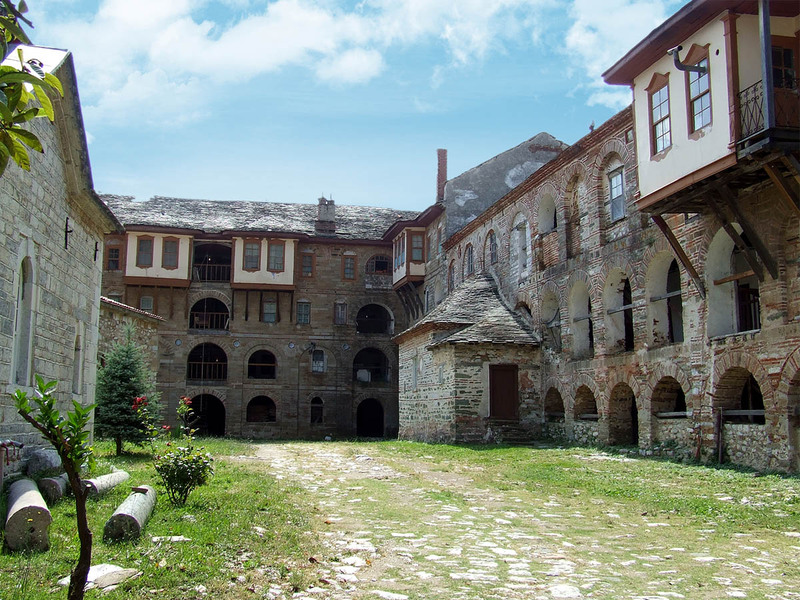 A solution to the urgent crisis of the accumulated debts was given in 1655 by the patriarch Dionysios III who bequeathed his personal fortune to the Monastery. The Katholikon of the Monastery, which was built during 963-1003 (10th century), constitutes the standard for Athonian temples. It is crowned by a large dome - which symbolizes the heavens - and it is supported by four pillars. The central part is richly decorated with murals of the Cretan painter of holy pictures Theophanes, the oldest of which dates back to 1535. The walls and the roof of the narthex and the exonarthex were painted in 1854. Opposite the Katholikon is the Prothesis with frescoes, the oldest of which dates back to 1512. Left of the Katholikon is the Tomb of Holy Athanasios in a chapel which is celebrated in the name of the 40 Martyrs. Behind the Katholikon is the library, the richest one in Athos, containing the oldest manuscript with minuscule writing that there is Mount Athos. The library also features more than 20,000 printed books, 2,500 manuscripts, valuable documents signed by emperors, patriarchs and sultans as well as 1650 Greek codes 650 of which are in a protective film. The Monastery within site consists of 15 chapels, while outside there are 19 more and in the mountain there are 5 Seats (places provided to a monk for life). The Monastery of Megisti Lavra includes the Sketes (small properties of the monasteries)of Holy Anna, of Timiou Prodromou of Kafsokalyvia, small villages in the desert as well as 40 Cells (buildings for two to six monks who live in a small house with its own chapel).Before entering the temple there is a stoup for blessing the Holy Water at the beginning of each month and which was built in 1060. Extremely valuable ecclesiastical utensils, filigreed gold canonicals, holy pictures are kept in the sacristy of the Monastery of Lavra - 4 precious holy pictures coated with gold which were given as a gift from emperors Andronicos I and Alexios Komninos I. One of these pictures is of the Savior which dates backs to 843 and of Ioannis Theologos. Another remarkable picture is also the picture of Virgin Mary the "Koukouzelissa" which constitutes the principal picture of the Monastery, the holy picture of Virgin Mary "Ktitoriki", the picture of the miracle performed by Saint Athanassios and the picture of Virgin Mary the "Oikonomissa", grails with precious stones and badges of the emperors of Byzantium. Other precious heirlooms are the crown and the 'bag' of Nikiforos Fokas, an imperial garment decorated with precious stones. Finally the steel bonnet is preserved respectfully. At the Monastery guests should definitely visit the murals of Theophanes the Cretan at the Katholikon dating back to1535and the Prothesis (1527), as well as the tomb of Saint Athanasios the Athonitis, also at the Katholikon. Equally remarkable are the "stoup", the rich sacristy and the museum of holy pictures as well as the historic "vagenario" (= cellar) with huge storage wine barrels ("paravoutes"). Today the Monastery hosts approximately 320 monks and provides overnight accommodation to a certain number of visitors who have requested this service in advance. It was named after Ioannis the so-called Koukouzelis who was born in the 12 th century in Durres. He was named Koukouzelis since he came from a poor family, always eating peas and zelia which means herbs. When he came to Constantinople he was enrolled in the Imperial College and thanks to his beautiful voice he earned the sympathy of Emperor Alexios I. Ioannis in spite of all the honors he received, he wanted to become a monk and to dedicate his life exclusively to God. And after he found out that the emperor wanted to marry him with a princess in order not to leave the Court, he decided to leave Constantinople. Ioannis resorted to Athos, he went to the Monastery of Agia Lavra and asked to be accepted as a monk. His responsibility was to graze the animals of the Monastery and with this task he secured his long wanted peace of mind and he kept his anonymity. As he always wanted to devote his life to God, he chanted with such sensitivity and sweetness that even animals stood still when listening to him. One day a hermit heard Ioannis sing and seeing the magnificent spectacle of the animals listening with such dedication, he hurried to the abbot and he announced with admiration the fact. Then Ioannis went unintentionally to his abbot and sat quietly a cell and on Sundays he sang at church. One day, tired as he was, he fell asleep inside the temple and then Virgin Mary appeared and told him to continue singing and she will not abandon him but she will reward him in Heaven for his singing. When Ioannis woke up, he found a gold coin in his palm which, deeply troubled, he respectfully placed it at the miraculous holy picture. Since then Ioannis continued his work even more eagerly, singing scrupulously and with respect so much and for endless hours that his feet got rotten from standing. It is said that again Virgin Mary appeared in front of him and healed him from the disease. The monks of the Monastery of Megisti Lavra commemorate Virgin Mary the Koukouzelissa on the 1st of October. Σημειώνεται ότι το καθολικό της Μονής της Μεγίστης Λαύρας αποτελεί το πρότυπο για όλα τα αγειορίτικα καθολικά με το οποίο και εγκαινιάσθηκε η αρχιτεκτονική τυπολογία του τρίκογχου οθωνικού ναού, δηλαδή με δύο μικρότερα ιερά εκατέρωθεν του κυρίως ιερού.